I use this because my son who is 8 love's to run and play. He also plays basketball. He SWEATS slot and it stinks lol! This cleans his clothes plus gets rid of the funkyness! My laundry smells sooo good! I can even smell it while wearing the clothes or once one of us walks by. The scent lingers and it smells fresh! We've been using this for a few years now. My husband is a construction and farm worker so he brings home some strong smelling laundry. This has been great and seems to be coming more prevalent as I am able to find at all of the stores I shop. 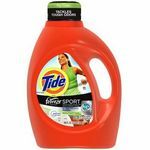 Tide plus Febreze Freshness Sport Liquid works amazing getting stinky sports and athletic clothes smelling clean and fresh. It takes nasty stains right out of clothes especially on my daughter's stinky soccer clothes and gear. Clothes that have smelly sports sweat smells, things that smell mildewy and every stinky smells in clothes all disappear and come out fresh and clean when using Tide sport with Frebreze laundry soap. If you have laundry that still smells after washing it with another brand of laundry soap, give Tide sport with Febreze a chance to prove how awesome it to make type of clothes smell fresh and amazingly soft. Love this! It works awesome for baby clothes with formula stains or stinky kid clothes from sweat and sports. It works good on oily stinky clothes also. I absolutely love this laundry detergent. It smells so incredibly fresh and fights away odors all day long. I have been a purchaser or tide for years and it still amazes me at how well it cleans my clothes. I would absolutely recommend - especially for those who workout or play sports! We live outdoors and our clothes get smelly and dirty. This product leaves our clothes smelling clean and fresh. 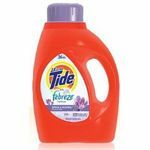 I use the Tide Plus Febreze Freshness Sport Liquid Laundry Detergent for my kid's soccer clothes, my workout clothes, and my husband's workout/outdoor clothes. 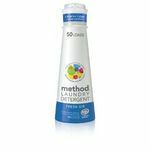 I have never had a detergent that works quite like this product does, I feel that the more I sweat, the more I smell the detergent, it is almost like my sweat activates the scent in the clothing. This detergent also works really well to get any remaining unwanted smells out of the clothes when they are dirty. The scent of this product is a very fresh/clean scent that is not overpowering, but leaves a nice lingering scent in the clothes. If you/ your family are active people who like to play sports and/or workout I would definitely recommend trying out this Tide Febreze Freshness Sport detergent, it is very unique and works great to get tough odors out of dirty clothes and to leave you smelling fresh. If you're someone who's very active but you worry about how you smell then this detergent is made for you. If I had to explain how this detergent works I'd say it works sort of like deodorant. If you wash your clothes in Tide Plus Febreze Sport and you're working out and sweating, all you're going to smell is the detergent. It does have a great smell, one of the best scents I have ever smelled. I especially used it when I was pregnant in the summer time because I sweated a lot. It didn't matter how much I sweated I could only smell this detergent from my clothes. I never thought it was possible for a detergent to achieve making a detergent that does this. However, the downfall of this detergent isn't that it doesn't clean well, in fact it cleans your clothes great. It's also not the scent that is the con of this detergent. 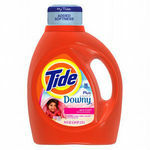 The price and size of Tide Sport is the downfall. The biggest size you can get it is 100 oz. I personally buy detergents by the big jugs because I have a ton of laundry to do during the week. 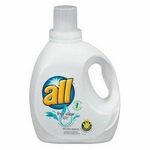 And the 100oz is about $12, the typical laundry detergent that size is about $8 or $9. It is worth the money, but I can't afford to use this detergent because I do laundry for 6 people. I would definitely recommend Tide Sport to anyone and everyone.